GENERAL SANTOS CITY, Philippines – Former defense secretary Gilbert “Gibo” Teodoro Jr is the new board chairman of Sagittarius Mines Incorporated (SMI). This development followed the completion of the sale of the majority stake previously held by Glencore International to Filipino-owned Alsons Prime Investment Corporation early this month. DAVAO CITY – The Army suspects of killing a pregnant mother and two of her children last October 2012 must be in jail, said a partylist representative during a Congressional inquiry on alleged human rights violations last Friday. “If information is already filed in court, there is no way that a warrant of arrest is not issued and the suspects must be in the provincial court of jurisdiction,” said Silvestre Bello III, representative of 1BAP partylist. ANGLO-SWISS miner Glencore plc has completed its exit from the long-delayed Tampakan gold-copper project in Mindanao in a $290-million deal that also covered two other mining assets abroad, it announced on Friday. Glencore “has completed the sale of the Tampakan copper project,” it said in a statement dated Aug.
MANILA – Ten murders; local government opposition; environmental warnings; a United Nations official’s alarm over the displacement of thousands of rural folk — there’s no stopping the controversial Tampakan mines project in Central Mindanao. Karapatan acknowledged the statement of the United Nations Special Rapporteur on the Human Rights of Internally Displaced Persons Dr. The provincial government of South Cotabato is holding its ground on its decision not to allow open pit mining in any part in the province, putting again on hold the future of Sagittarius Mines Inc (SMI). SMI owns the Tampakan Copper and Gold Project located in the mountainous area of Tampakan in South Cotabato. In a resolution passed on July 21, the provincial board “reaffirmed the validity of Section 22 (B) of the Environment Code that prohibited the use of the open-pit mining method in mining activities” anywhere in South Cotabato. GENERAL SANTOS CITY—B’laan tribal leader and antimining activist Daguil Capion, who had eluded a massive manhunt by government forces for years after he was charged with banditry and murder, fell into the hands of police in Malungon, Sarangani. 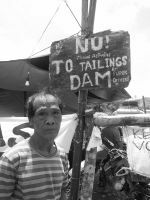 Environmental group Kalikasan People’s Network for the Environment (Kalikasan PNE) hailed as a victory for the people’s movement the divestment of Anglo-Swiss mining giant Glencore from the $5.9 billion Tampakan mining project in South Cotabato, SOCSKSARGEN region. “Glencore, potentially the largest mining project in the country to date, ultimately failed in the face of massive people’s resistance against foreign and large-scale mining. GENERAL SANTOS CITY – Commodities trader Glencore Plc has reportedly agreed to sell its entire stake at Sagittarius Mines Inc (SMI) to Indophil Resources NL, which was acquired by Alsons Prime Investment Corporation for a yet-to-be-disclosed amount and acquisition terms. This breaking development followed the January completion of the sale of Indophil Resources NL to Alsons Prime. The report means the complete exit of the Switzerland-based Glencore PLC from the US$5.6 billion copper and gold project of SMI in Tampakan, South Cotabato. Cagayan de Oro – Leaders of B’laan from Bong Mal in Tampakan, South Cotabato submitted today a position paper to the National Commission on Indigenous Peoples (NCIP) en banc against their regional counterparts’ activities to facilitate the free prior and informed consent (FPIC) required for the Tampakan Copper and Gold Project. Five leaders went to CDO to request the en banc to immediately order the postponement of any FPIC-related activities in their area.